Paper Mario Description Lets Mario earn Star Points even if he escapes from battle. Mario with Watt revealing the hidden block the Runaway Pay Badge is in. Runaway Pay is a badge in Paper Mario. It is in a red hidden block between three palm trees in Dry Dry Desert, at the scene to the north of the scene with the Nomadimouse. 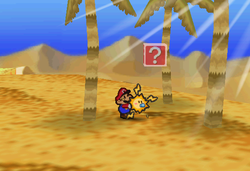 If equipped, it makes Mario able to earn the partial Star Points when he runs away from a battle. This badge is hinted by the wise Toad in Dry Dry Outpost. This page was last edited on July 22, 2018, at 03:31.